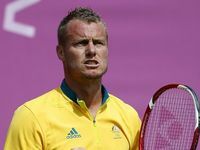 IN A field jammed with Olympic and World Champions, Australian slalom paddler Kynan Maley has finished in eighth place in the C1 semi-final and secured his place in the race for an Olympic medal later on day four. 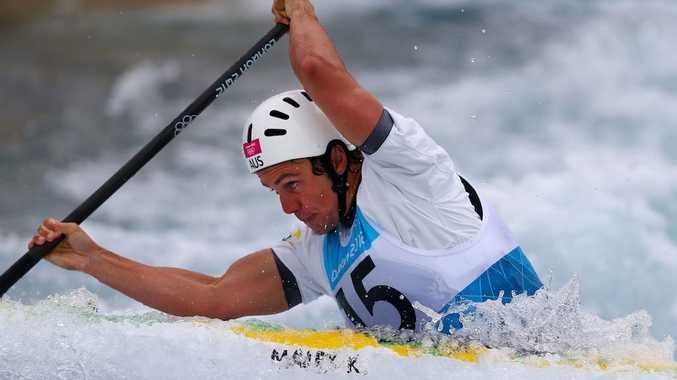 In wet and windy conditions at the Lee Valley White Water Centre, Maley was the first athlete on the course, with the 12 competitors racing in reverse order of their qualification. With just one run in the semi-final, and needing a top eight finish to qualify for the final, it was do or die. Racing on a newly set course, the 30-year-old paddler made an early mistake, clipping the first gate and copping a two-second penalty, but determined not to let this early error stand in his way at a shot at a finals berth, Maley recovered his composure and put together a strong and fast race. "I'm happy with most of it," Maley said after his race. "I'm really regretting the first touch, I can't really explain it - I'm not sure why I touched it, maybe just slight nerves at the start. But I kicked it in pretty well for most of the run. I just went a little bit too aggressively, wasn't quite in position on the spin just below the first drop so I dropped another couple of few seconds there. But the rest of the run was pretty good. I was hurting by the end." Maley finished in a total time of 105.49 including the two second penalty, and then endured a nervous wait to see how the athletes after him finished. Teng Zhiqiang of China and Aleksandr Lipatov of Russia followed Maley, both finishing below the Aussie. 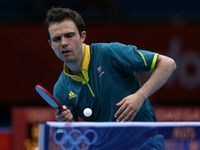 Grzegorz Kiljanek of Poland was the next athlete to drop below Maley and then it was just a matter of one more athlete - and with the world's top ranked paddlers still to come, the outlook wasn't certain. World Number 1 David Florence of Great Britain, by far the crowd favourite and with the added benefit of having trained at the Lee Valley White Water Centre for over a year, was out of the gates eighth. Despite producing a great start to his run to the rapturous applause of the crowd, Florence made a crucial error at a gate and wasn't able to recover, finishing in 104.16 ensuring that Maley would remain top eight. Maley will now regroup and take to the same course just after 3pm (London time) to contest the final where it will come down to one run - one chance. "Every run I want to improve and try and build through," Maley said. "Obviously I won't hit gate 1! I think I'll get the boat running a little bit more through the top. I was a little bit jerky on the rhythms, a little bit guarded. I think I'll just chase it that little bit harder because I'm going for the win." 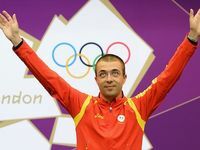 German paddler Sideris Tasiadis goes in as the top ranked athlete after a blistering 98.94 clean run. Dual Olympic Champions Michal Martikan of Slovakia (1996, 2008) and Tony Estanguet of France (2000, 2004) will also both be vying for the top of the podium.